The fine look of this "Only Us" engagement ring is thanks to its princess cut design. 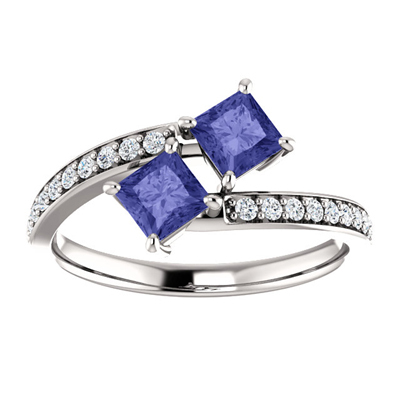 The two dark-blue 4mm tanzanite stones are made with deep identical cuts that offer a great sense of detail. These are especially made to be easy to sport with a 14k white gold body plus 19 diamonds with a weight of 0.19 carats. We guarantee our "Only Us" Pricness Cut Tanzanite and Diamond 2 Stone Engagement Ring in 14K White Gold to be high quality, authentic jewelry, as described above.